To get up and really put in work on the court can be tough! If you need some inspiration, Bluefish Sport uses feng shui color attributes to help you dress your best while playing your best! Though they produce smaller collections and boutique-like apparel their clothing ranges from basic workout pieces to exotic designs sure to power up your game. Time to jump into NEW apparel from Bluefish Sport for Spring 2018! 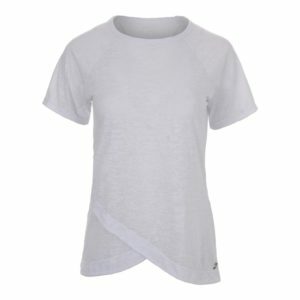 If I’m going for the “less is more” look on court, I’d rock the Women’s Elegant Tennis Shirt in Gray (left) with the Elegant Skirt in Black and Gray (right). 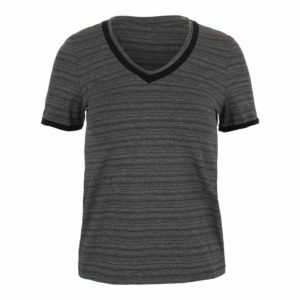 The black and gray striped pattern compliments the thick trim that strikes me as retro. The matching skort comes with exterior pockets so you can stay lady-like when grabbing equipment. 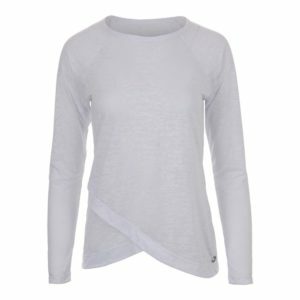 If you’re a club player seeking a dressier option, the Women’s Burnout Short Sleeve Tennis Top in White or the long sleeve version can fix you up! If you’re looking for something wilder, make waves in the Bluefish Flow Print. The Flow Print is on four fun pieces and can be matched with lots of different colors. You can wear the Women’s Pink Skort (left) on the tennis court, or you can warm up in the legging (right) paired with the Flow Tennis Bra. I own one of these and it’s SO comfortable! 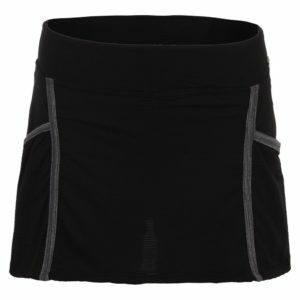 The fit of the pant is amazing around the waist and glutes. It’s important to have a solid fit when you train. Which outfit will you take the court in? There are more gorgeous prints for you to choose from here at the Bluefish Sport page at Tennis Express!